Tonight was the second practice at the Wells Fargo building in downtown Los Angeles. Last week, I’d climbed it once for speed and once to make a chart, and now, armed with the chart, I had made up precise split times and I was ready to tackle it for real. The actual climb from the lobby up to 55 is 1,126 steps and about 690 feet. That’s just 26 feet more than the climb up the 777 Tower. Being that 26 feet is about two floors, and I was averaging 10 seconds per floor there, I figured I should be able to do this in about 20 seconds more than my best time at 777. Since I did that in 8:19, I thought 8:40 seemed like a good goal. So I made up some split times to aim for that. I also figured out how to do the steps at the beginning and the end to get the most efficient pattern. The method I worked out has one triple step on the flight just coming up to 3. 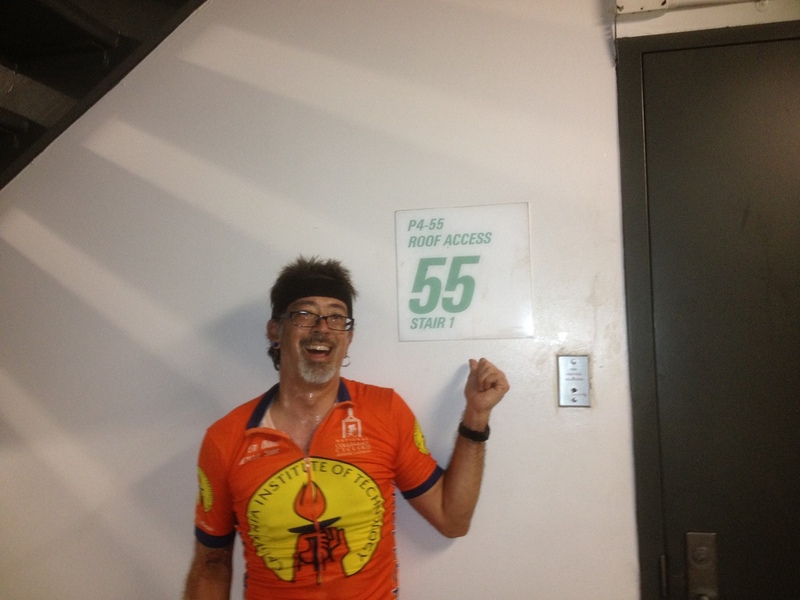 And there is one sacrificial non-climbing step on the big landing at 53. By doing that, I can hit every single landing on my left foot, which is perfect for doing the right turns. There are 107 landings where there is a right turn. So saving even a fraction of a second on each of them is worth it. Chris came along this time, and we started up the stairs together. That worked out well, since I go faster when he’s tailing me. I was on schedule all the way up to my time checkpoint at 34, but that was about where Chris dropped off the pace. I kept going as best I could, but I was about five seconds off pace at the checkpoint at 45. When I got to 53, I remembered to take the one extra step to switch sides, and then I ran up the last eight short flights up to 55. 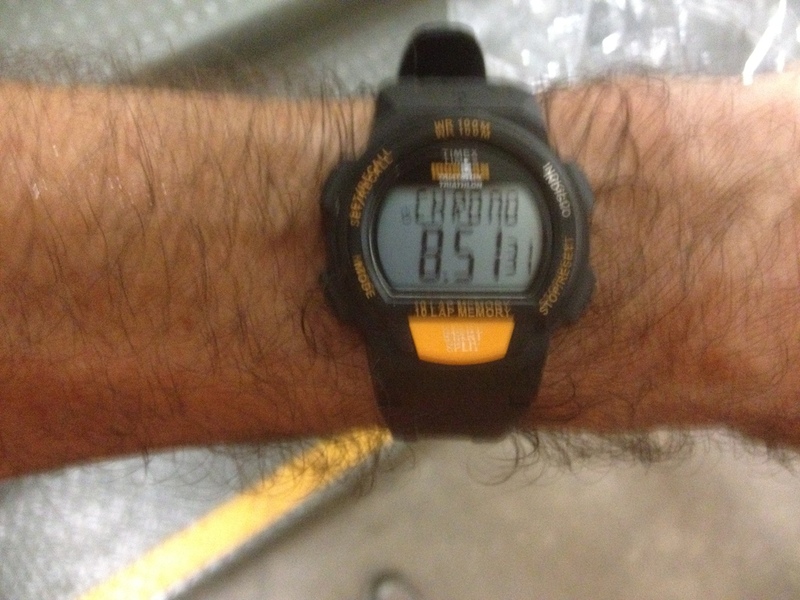 I did the traditional face-plant on the landing at 55, and when I looked at my watch, it said I’d done it in 8:51. While that’s not quite as fast as I’d hoped for, it was still a full 8 seconds faster than my best time last year. So there’s nothing not to like about that. We rode the elevator back down to the lobby and got ready to go up again. 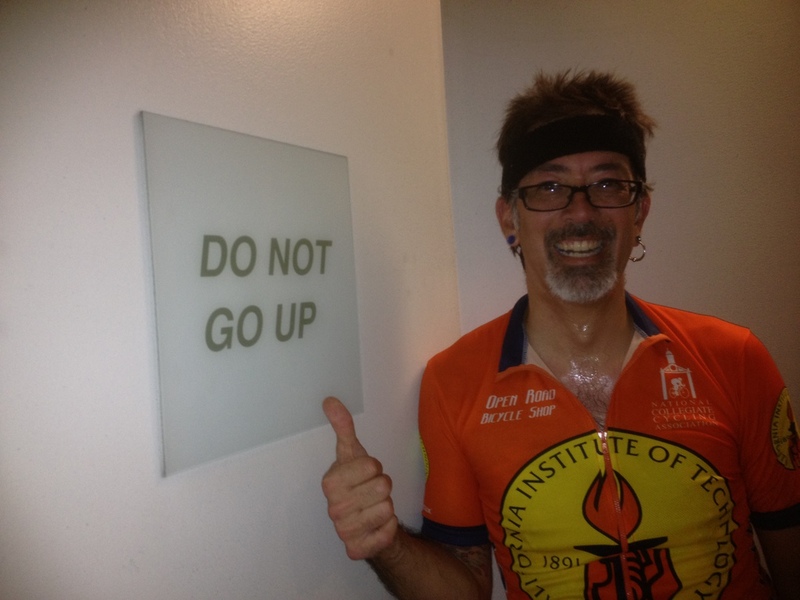 My friend Mary had told me that there was a big sign on one of the landings that said “DO NOT GO UP”. I presume that’s intended for people using the stairs to evacuate in an emergency. I’d never noticed it before, so I wanted to look for it and get a picture. I also wanted to get a picture of the old lady on the park bench mural on the landing between 43 and 44. I’d started my watch at the bottom, but when I got to the top, I forgot to stop it. And since I’d stopped for photos on the way up, I figured my time didn’t really mean much anyway. It was a good evening. Pretty much any practice that involves a new best time is a good one.